I love learning more about the history of this beautiful area…and have a fascination with old, historic buildings in particular. This is an amazing story of just one single house. Oh and I can’t wait to now visit the Seattle Room on the 10th floor of downtown library! Thanks for making me aware that even existed! In one hour the hundred-year-old Big Green House was reduced to rubble. 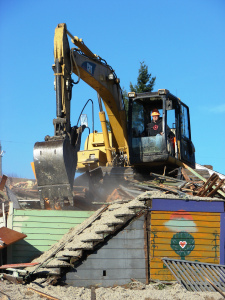 On February 17, 2015, the hundred-year-old Big Green House at 7321 35th Ave NE came to the end of its lifespan and to me, it felt like the death of a friend. The Big Green House was like an eccentric, misunderstood person, perceived by some as spooky because of the way the house loomed up over the surrounding business district. In getting to know it, I found the Big Green House to be more like an elderly person with long-held memories of bygone days. The Big Green House was clothed in the architectural preferences of long ago, and will now be replaced by the newest design trend in commercial districts in Seattle: a storefront building with apartments in the upstairs units. This entry was posted in Uncategorized on April 6, 2015 by cherryblossomsmiles.